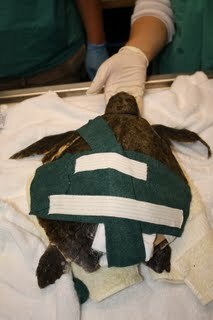 A Kemp's ridley sea turtle with a severe fracture of the carapace after initial cleanup and stabilization. Crater Lake or Crater for short was brought in yesterday afternoon off of a beach in Sandwich, Mass. The Aquarium's Marine Animal Rescue Team went down and met up with James and Dennis from Wellfleet Audubon. They had already taken the turtle off the beach and were ready to get the turtle packed up in our ambulance to head back to the Aquarium. This was another Kemp's ridley that had a severe fracture to the carapace (top part of shell). It looks like it probably was made by a boat propeller. We cleaned up the shell a bit and determined that the fracture did not appear to involve any major organs. Dr Innis and Dr Cavin flushed out the areas of soft tissue under the fracture and tried to determine the best route of action. After stabilizing the fracture, Crater was tucked in to the ICU for the night. So today we decided to put the turtle back together again! After cleaning the area and adding some topical anesthetic our Veterinarians started to piece together the carapace. After the carapace was in place we wanted to try and bring the coelomic cavity (the space between all the organs in the body cavity) back into contact with the shell. So we started a vacuum-assisted closure. This will create negative pressure in the crack and slowly draw the coelomic lining towards the shell. The turtle is very active and the blood work currently does not show any major anomalies. We are hopeful for a positive outcome! what kind of analgesia did you guys use?? Mass Stranding Training, Work and Fun All in One! How can you help the rescue team? Acadia makes a big splash! The new turtle season starts BIG!